Whether it’s laying out its ambush-and-heist schemes or racing through French city streets at breakneck speeds, Ronin expects viewers to keep up. John Frankenheimer’s film makes the groan-worthy mistake of explaining the significance of its title twice—first in a textual introduction, and later via an expository conversation between two characters. Yet in all other respects, the movie is a work of no-nonsense proficiency, moving at a fleet pace that allows the audience to revel in the sights and sounds of freelance ex-military professionals and criminals adeptly concocting and executing elaborate smash-and-grab plans. The heists initially involve Irish beauty Natascha McElhone conspiring (on behalf of boss Jonathan Pryce) to steal a briefcase from a moving caravan in Nice. To accomplish this endeavor, they enlist the help of an international team that includes reliable Jean Reno, skittish Sean Bean, calculating Stellan Skarsgård, and calm, composed Robert De Niro. Working from an economical screenplay by David Mamet (under the pseudonym Richard Weisz) and J.D. Zeik, Frankenheimer delineates his players’ personalities in quick, sharp brushstrokes. 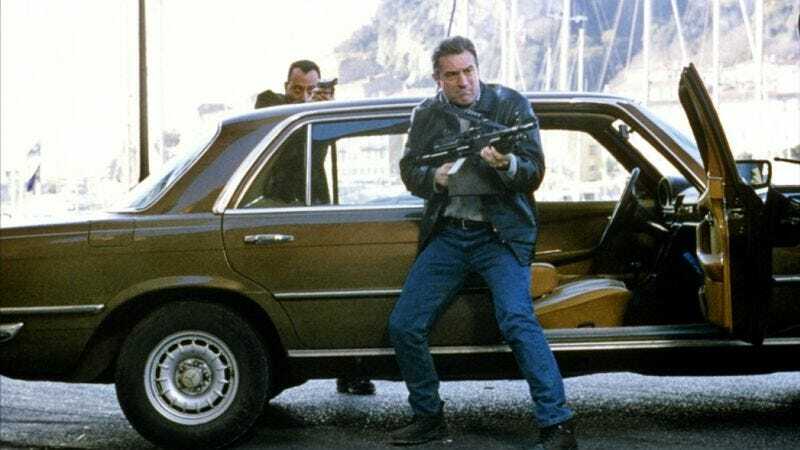 Preparation and loyalty are the twin codes that govern De Niro’s nominal hero, as he navigates bleak, grey streets, staircases, and alleyways. Frankenheimer provides narrative details with an urgency also felt in his car-chase sequences, which—carried out in un-flashy black BMWs, Audis, and Peugeots—are marked by an adrenalized bluntness, culminating with an astounding pursuit through crowded boulevards and against oncoming highway traffic. Featuring a stellar cast of actors who were either on the cusp of stardom (Bean, Skarsgård) or hadn’t yet lost their gritty charisma (De Niro), Ronin is nonetheless most notable for its stellar direction, characterized by diagonal visual lines—be it winding roads, throngs of sightseeing tourists, or De Niro wielding weapons in close-up—that reflect the sideways complications and untrustworthy allegiances of this underworld saga. Availability: DVD and Blu-ray, rental and purchase from major digital providers, and streaming on Netflix.